Atopic dermatitis is a very common, often chronic skin disease that affects a large percentage of the world's population. It is also called eczema, dermatitis, or atopy. Most commonly, it may be thought of as a type of skin allergy or sensitivity. The atopic dermatitis triad includes asthma, allergies (hay fever), and eczema. There is a known hereditary component of the disease, and it is seen more in some families. The hallmarks of the disease include skin rashes and itching. Although atopic dermatitis can occur in any age, most often it affects infants and young children. In some instances, it may persist into adulthood. Multiple factors can trigger or worsen atopic dermatitis, including dry skin, seasonal allergies, exposure to harsh soaps and detergents, new skin products or creams, and cold weather. Environmental factors can activate symptoms of atopic dermatitis. It is a disorder of hypersensitivity of your skin towards various things. This hypersensitivity is the root cause of atopic dermatitis. As long as that hypersensitivity of the body has not been corrected it will not be cured completely. Homeopathy helps to alter this hypersensitiveness of your body to normal form and thus cures the complain permanently. Any external application, anti histamine drugs and corticosteroids will not help to cure the condition permanently if not treated at the root level. In our Multicare homeopathy online treatment center many children with atopic dermatitis have benefitted using our advanced homeopathic treatment packages. 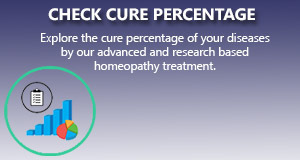 We apply the most scientific and research based homeopathy treatment package for atopic dermatitis that gives a long standing cure to the ailment.